Huge Savings Item! Free Shipping Included! Save 16% on the Accuform Signs TAR158 Tags By-The-Roll Barricade Status Tags, Legend''DANGER BARRICADE TAG'', 6.25'' Length x 3'' Width x 0.010'' Thickness, PF-Cardstock, Red/Black on White (Roll of 250) by Accuform at Mocksville Fire. MPN: TAR158. Hurry! Limited time offer. Offer valid only while supplies last. 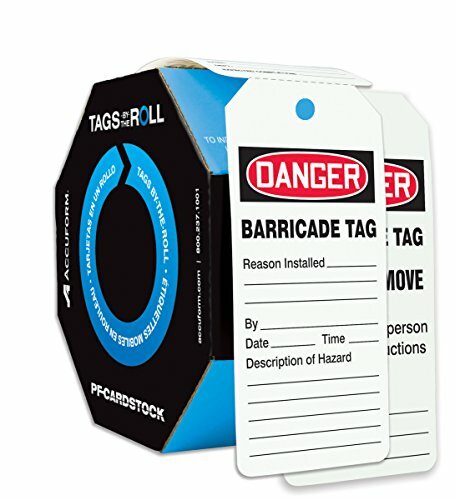 Keep a large quantity of safety tags available with Tags By-The-Roll–a portable and disposable dispenser roll for your on-the-go safety tag needs. Keep a large quantity of safety tags available with Tags By-The-Roll–a portable and disposable dispenser roll for your on-the-go safety tag needs. Tags By-The-Roll feature an eye-catching, octagon-shaped cardboard dispenser with 250 PF-Cardstock tags housed inside. Pulp-free PF-Cardstock tags are more durable than traditional cardstock, and will not crack, distort, or shrink. The matte surface is scuff-resistant and easy to write on with pen or marker. Simply pull out the 6-1/4" x 3" tag from the box to easily tear off. The next available tags stay neat and clean together in the 6-5/8" x 6-5/8" x 3-5/8" compact dispenser box, which features a 1-1/2" perforated center hole for mounting. Tag Size: 6-1/4" x 3"; Top of tag has oversized 3/8" plain hole; Dispenser Size: 6-5/8" x 6-5/8" x 3-5/8"